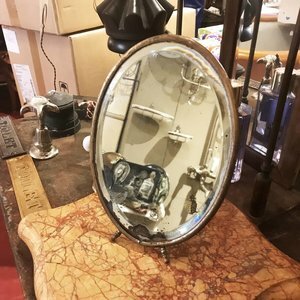 Vintage bevelled mirror with an oval shape. Small mirror to use as a standing make up mirror or as a hanging one. Small bevelled mirror in an oval shape. To be used either standing or hanging. Nickel finish frame. Nice patina. Manufactured around 1920.